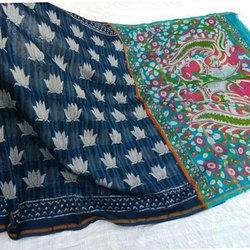 We are manufacturing and wholesaling indigo Print Chanderi Silk Sarees. We are among the veterans in the industry for manufacturing and wholesaling Dabu Print Chanderi Silk Sarees. We are made from high quality chanderi silk and is resistant to wear and tear. The offered chanderi silk saree is printed with superior grade of colors and is color retaining as well. We are known for the timely delivery of orders. High Grade Raw Material, 100 % guaranteed of color and fabric. 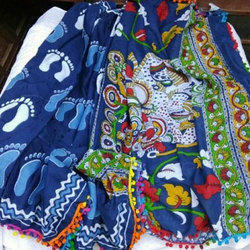 We are a noteworthy organization in the domain, engaged in providing high quality of Chanderi Saree. For designing this chanderi saree we use optimum quality fabrics which add one more feature on its quality. 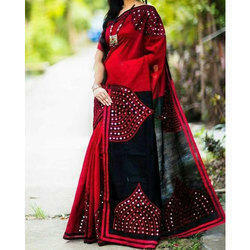 Our given chanderi saree is made according to the latest fashion trend and provided in bulk quantity. We check our gamut of chanderi saree on predefined standards which is set by the industry. 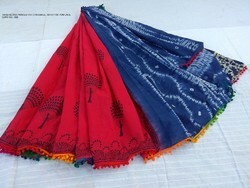 Also, our customer can take these chanderi saree at nominal rates. 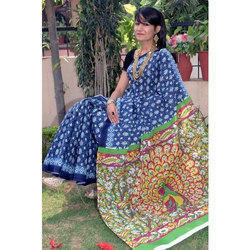 We are making all kind of design and color in chanderi silk sarees. It is 100 % guaranteed color and fabric. We obligated to meet the quality standards. Vastra gram. We are manufactures hand block printed chanderi silk sarees in super dying fabric on cotton Malmul With blouse Fabric and color 100 % guaranteed. Traditional Chanderi Silk Saree to the clients. Traditional Chanderi Silk Saree is stitched and designed in accordance with industry market trends by utilizing premium quality material. 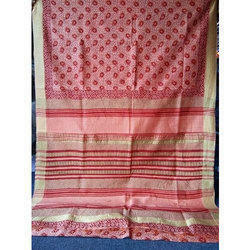 We are engaged in offering a premium quality of Hand Block Print Chanderi Silk Sarees. That is widely demanded in the market. This SAREE design is examined on quality parameters for making certain its quality & provided at pocket-friendly rates with special discount. We are making hand work Aari Work Saree or suits.